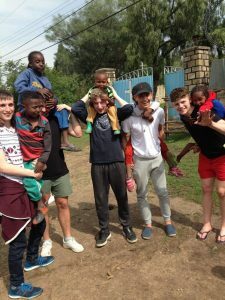 One of the most important and rewarding activities of the community work undertaken by the College is in Africa. The College offers fifth year students an opportunity to spend two to three weeks working and living with the Vincentian community in Ambo, Ethiopia each June. The venture sees successful applicants engage in a range of voluntary work there including teaching in the local Vincentian school, working in the Vincentian food programme, assisting in the Vincentian school for the deaf and coaching Ambo United FC. Students raise funds to meet their travel and subsistence expenses and events are organised within and outside the college to raise funds for the St Vincent’s Castleknock College Development Programme in Ambo. This project has enabled the construction of expanded education facilities as well as the provision of medical and food supplies to those who wish to avail of the aid provided by the Vincentian community in Ambo.